We are moving forward with our Rain Garden project this spring! We are planting around the rear storm drain on April 30 with the assistance of Fairfax County Stormwater and their R3 Program (Revitalize, Restore, Replant). They are providing the native plants and will be on site to work with the 5th graders who will be doing the actual planting. Friends of Accotink Creek will also be conducting a watershed educational session in the schoolyard that day as well! 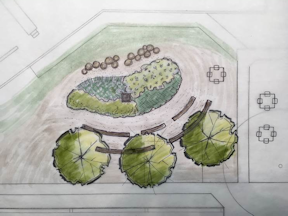 More details on the Rain Garden Project page.